Why do passengers clamor for business class flights? The simple answer is because of the benefits associated with Business and First class. Most Long-haul International flights provide lie-flat or flat bed seats. In fact, since the demand for Business Class increases every year most airlines have upgraded or redesigned their Business Class cabins. Business or First Class in-flight service means you have the option of curated restaurant-quality food, unrestricted free alcohol beverages and cutting edge entertainment such as movies, music or television shows. Longe Access means you can hang out before or after your flight in an airport lounge to avoid long food lines, catch up on some work, freshen up with a shower or relax on a soft leather sofa. 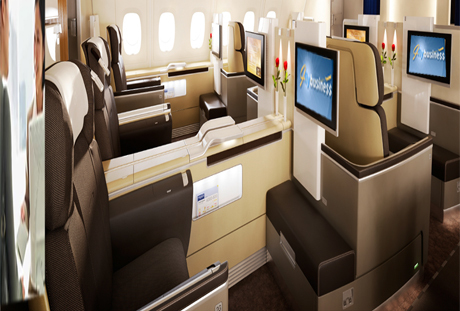 While business class may be costly, discounted business class airfares are available with IFlyBusiness. You will succeed in getting cheap Business or First Class seats if you book with us; we will even beat our competitors by $100.00! The simplest way to obtain business class airfares are available with IFlyBusinessreduced prices is to call our office to speak to an IFlyBusiness agent. iFlyBusiness.com– specializes in discounted Business and First Class global travel, special business class airfares and first class flights and have for over eleven years.